Register now for FREE admission to the HKTDC Hong Kong Watch & Clock Fair! You are receiving this trade promotion information since your contact resides in the database of HKTDC. Please do not reply to this email directly as this address is unattended. Company : Zerone Limited Brand : o.d.m. 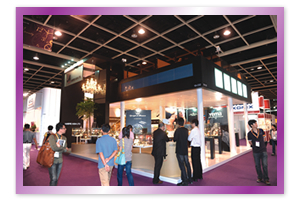 The HKTDC Hong Kong Watch & Clock Fair is the largest industry event of its kind in the world. At the last edition, 700 exhibitors from 14 countries & regions showed collections of the very latest designs in a wide spectrum of market sectors and prices. A total of 16,521 buyers from 97 countries & regions sourced timepieces, ranging from trendy to classical styles, to create their new-season inventories with broad consumer appeal. Brand Name Gallery is firmly established as the home of high-recognition, branded watches and clocks, showcasing around 100 brands in 2010. Opening Brand Name Gallery to the public on the last day of the fair, gives trade buyers the flow-on value of expanding brand recognition and creating anticipation for new season releases. World Brand Piazza is a specialist display area in the Brand Name Gallery for luxury brands, showing limited edition collectibles and other rare or important pieces. Its debut in 2010 featured such prestige brands as Audemars Piguet, Breguet, Cartier, Omega, Piaget and Vacheron Constantin. Renowned brands have been invited to the 2011 fair to showcase the immaculate craftsmanship and artistry of haute horlogerie. There are watches destined to be the heirlooms of the future and these can be seen in the Pageant of Eternity. For buyers who are seeking complete watches with timeless good looks and a high level of workmanship, this elite zone represents a sourcing hub of outstanding excellence. Manufacturers of timepieces of all kinds are well served by exhibitors at the fair. In the Parts & Components zone, international suppliers exhibit of a wide range of quality products. Influential voices in the international watch and clock industry are heard in the Asian Watch Conference and Hong Kong International Watch Forum. The Conference offers the chance to share the expertise and knowledge of keynote speaker Jason Martin, a co-founder of the cutting edge, award winning US design studio, NEW. Among the studio's groundbreaking products are the Columbia Altimeter watch and the Nike Sport Chronograph. The annual Hong Kong Watch & Clock Design Competition promotes the talents of designers in Hong Kong, both established and aspiring. The Open Group theme, 'Classic Reunion', invites designers to interpret the elements which give watches their classic appeal, while the Student Group will marry aesthetics, materials and functionality in a 'Dream Team' theme. Now you can locate the right products you need by getting a list of relevant exhibitors with booth numbers and product photos at the fair. Look for this friendly sign at the fairground. © 2011 Hong Kong Trade Development Council. All rights reserved. If you wish to unsubscribe this type of email news, please click here.